The start of my gardening year has not been easy. 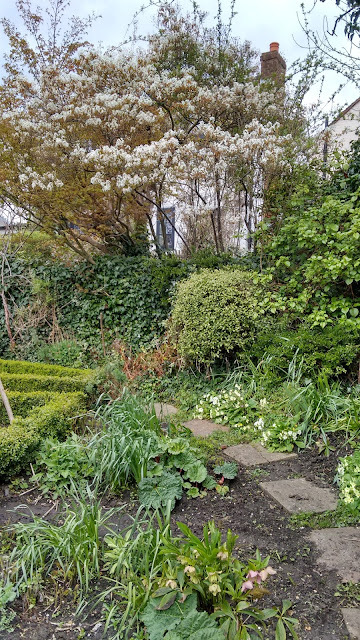 This area was over run with wild garlic which although rather a nice plant in a small clump, it does rapidly take over. 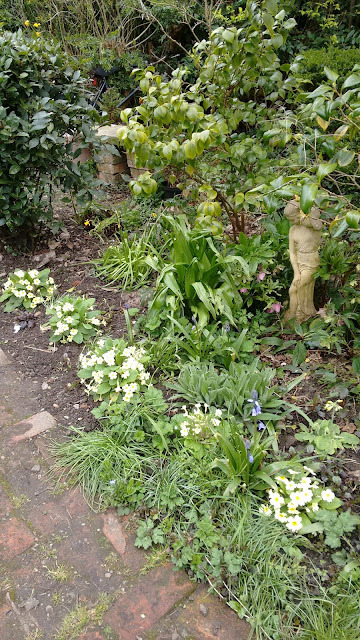 Fortunately because I like potting up plants, dividing and taking cuttings, I had a number of primroses to fill the gaps. The compost heap ugh! 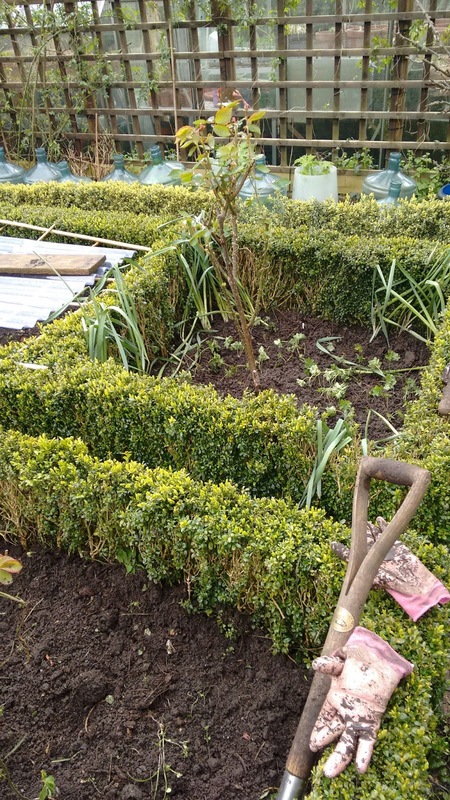 what a hard job that was digging out and spreading on some of the vegetable beds and roses. 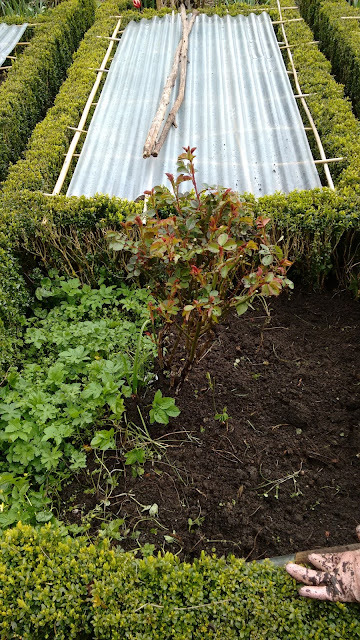 This is usually Mike's job, as is the vegetable growing but as he is just getting over an operation it has been all down to me. Finished with last years compost turned and ready for courgettes later. 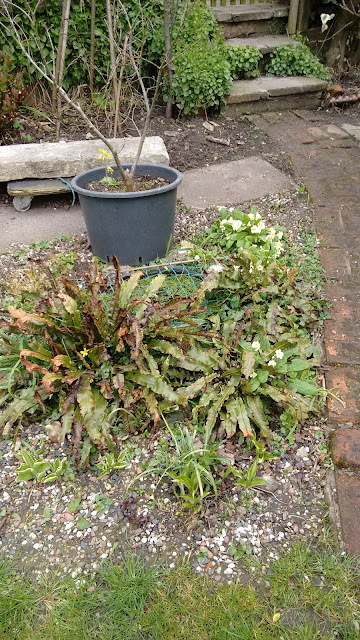 This little bed of mainly hostas was weeded not many weeks back but already could do with another weed but will have to take it's turn as I am far from having weeded much of the garden even once. 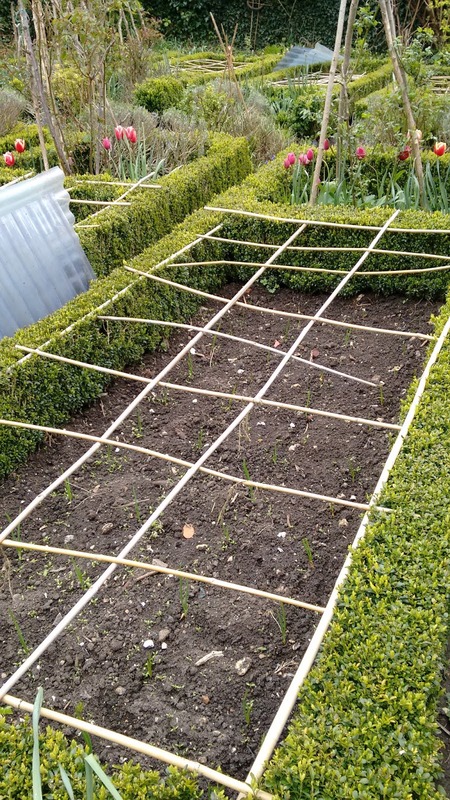 Onions just beginning to shoot. What are those bamboo canes for you might ask? It's to keep all the cats in the neighbourhood from soiling my vegetables and it works well and deters the pigeons too. 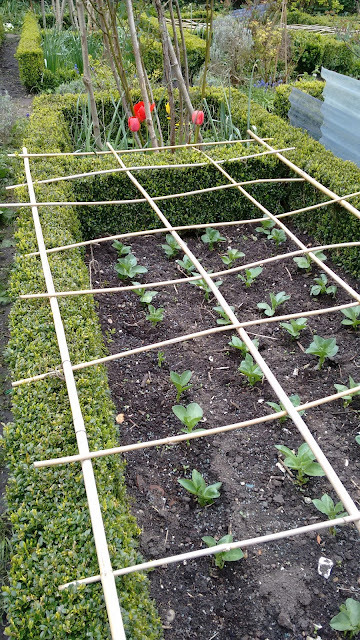 Broad beans which were started in pots in the greenhouse and transferred out a few days ago. Hmm growing plastic sheets! well no but they work well to protect the seedlings from late frosts and torrential rain. We have a problem with mice at present hence the box but nevertheless I seem to have had little success with the peas and will need to re sew. Note the clean paths between the box another job well done. 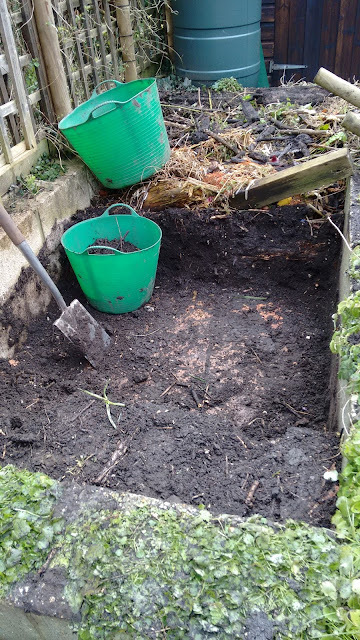 The last three days I have been busy digging out ground elder - the bain of my life. As you can see it has taken over in all these box boxes smothering the geranium which I think is Marginata. These boxes of box used to be full of daffodils but very few remain and I am not sure why. 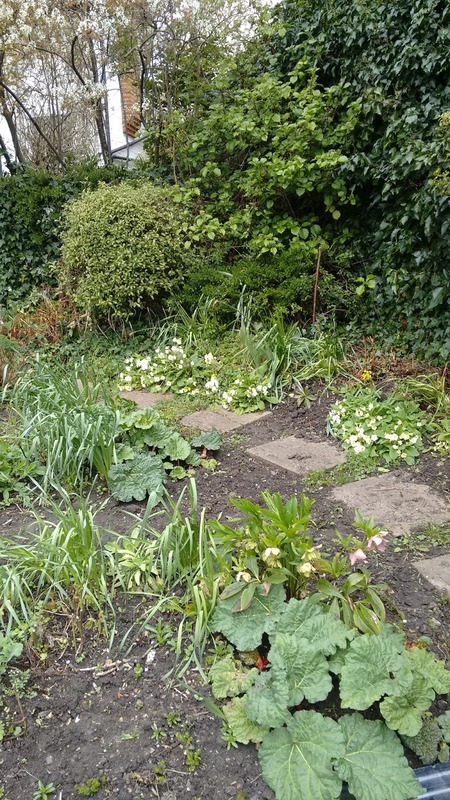 This year has been a disaster for daffodils in my garden, maybe the dry winter didn't help. 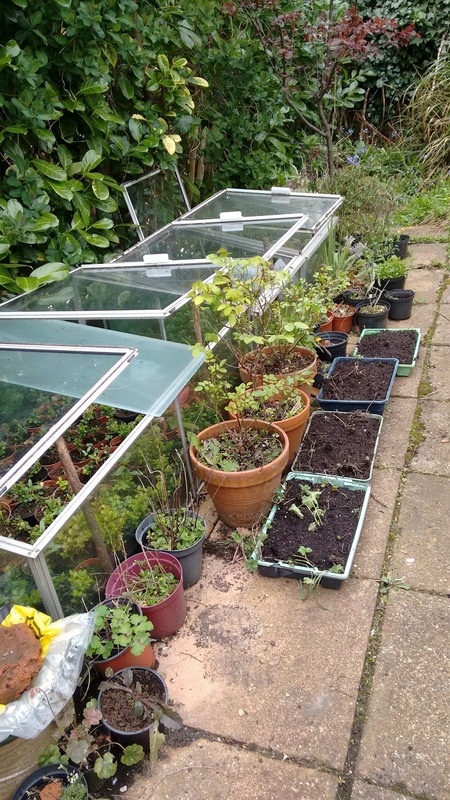 The box were all grown from cuttings some years ago. Over the years I have realised that most things grow towards the sun and ground elder is no exception. 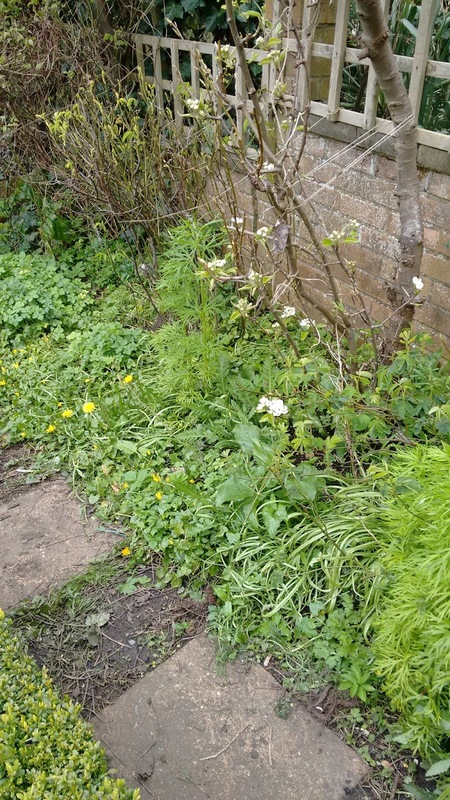 This bed was full of ground elder and although there are a few bits in there among the weeds it has mostly crept under the path and into the above boxes. So one of my next tasks in hand is to clear the weeds out of this bed. 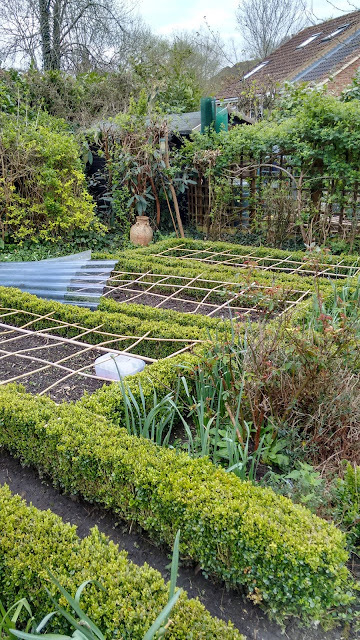 These beds across the other side of the garden a bit more shaded have had some tidying up but need finishing. As you can see there are plenty of daffodil leaves here but there were not many flowers. Obsessed with plastic! you might say. 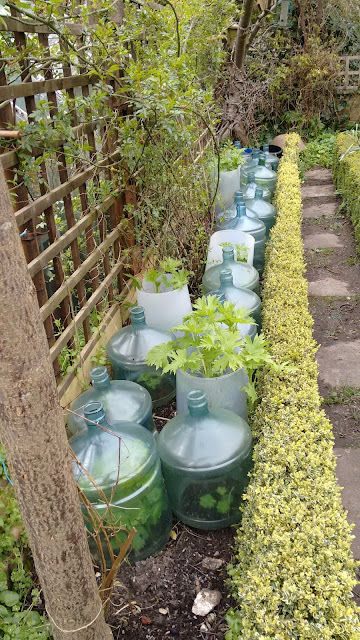 but these old water bottles and the odd lamp shade make great cloches for my delphiniums. 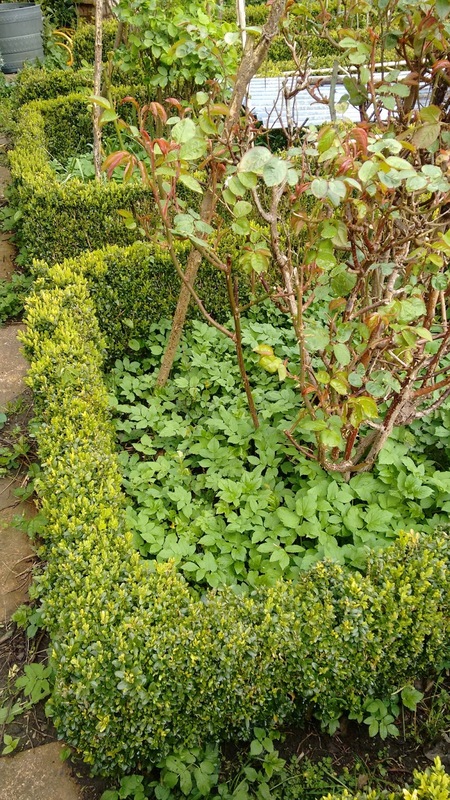 They have been slow growing to start this year and this bed has been weeded twice already - unusual for me with so many more waiting to be weeded but once the delphiniums grow it isn't so easy to weed without damaging them. 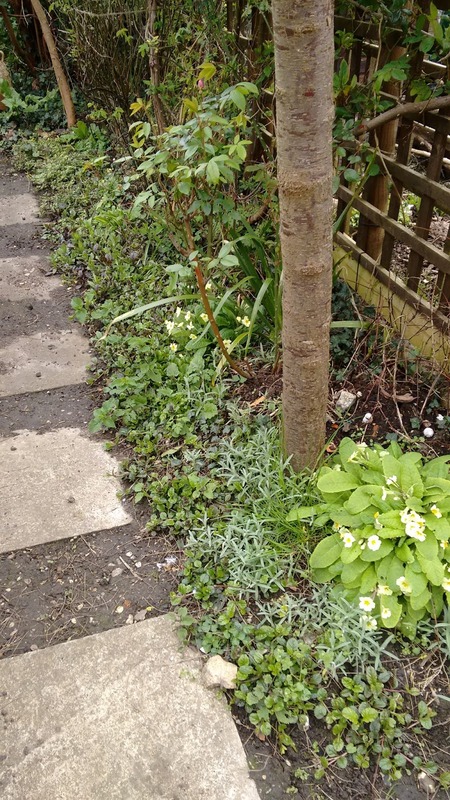 A shady border waiting attention but not too bad. I am making a conscious effort this year to reduce garden jobs, hah! it doesn't feel like it. 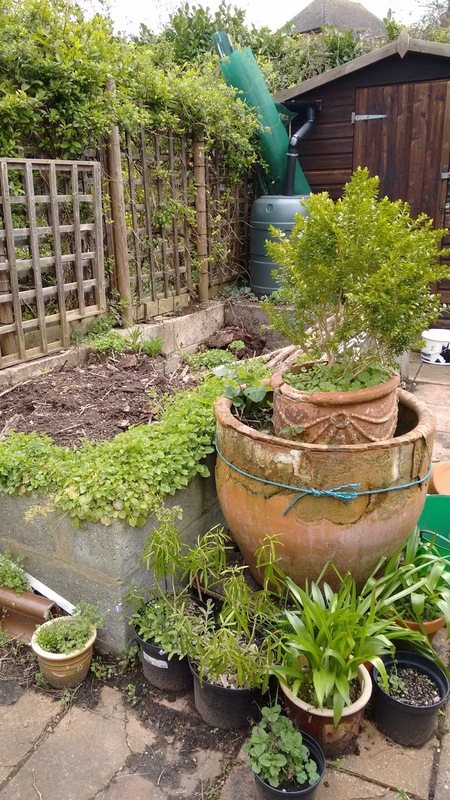 But I am trying not to propagate for the fun of it as it can be so time consuming, it is fairly easy going standing at a bench but it doesn't exactly get the garden weeded and it's extra work planting out and watering. I over winter my agapanthus and lilies in the green house and these two Jacaranda trees which seem to have survived the winter in a cold greenhouse although we have had an exceptionally mild winter this year. 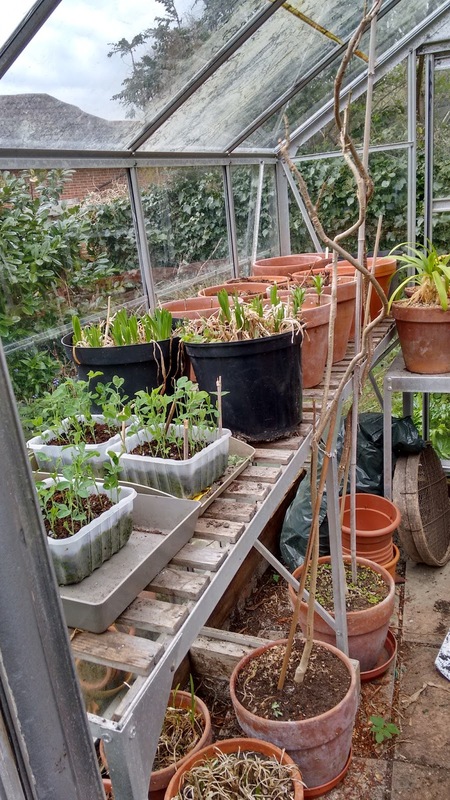 The sweet peas are one of my few things I am growing from seed - the mice have already been in the greenhouse and eaten some of them but I think I have stopped that now. Pots with runner and climbing beans, hope they germinate ok. 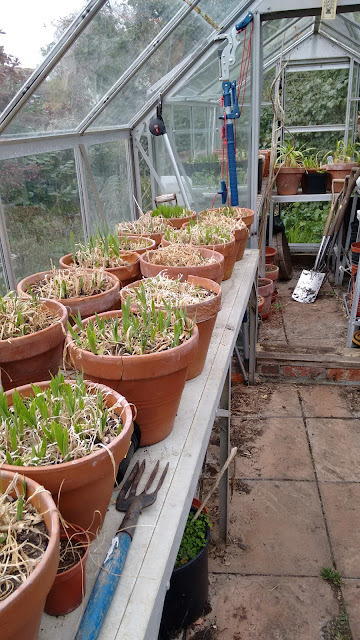 The buckets have leeks growing in them. 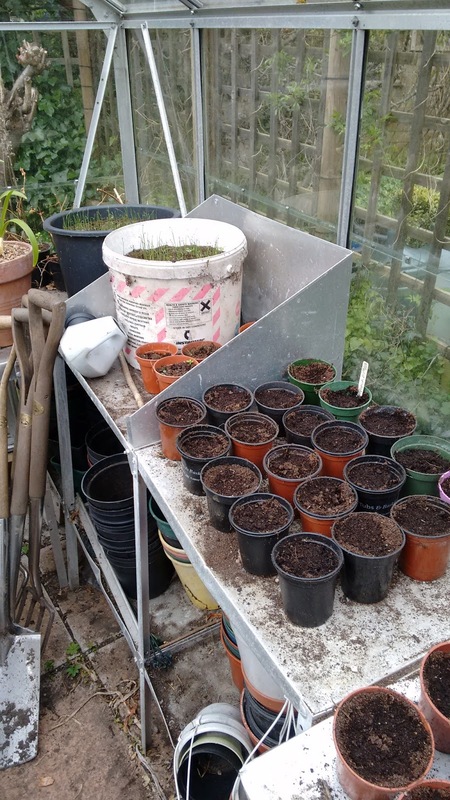 Just a few bits and bobs plus a number of baby box in the cold frames for my daughter's garden. Don't you love Amelanchier it really is one of my favourite small trees/bushes, I have to remind myself to look up and enjoy it. This is usually what I would be doing this time of year. 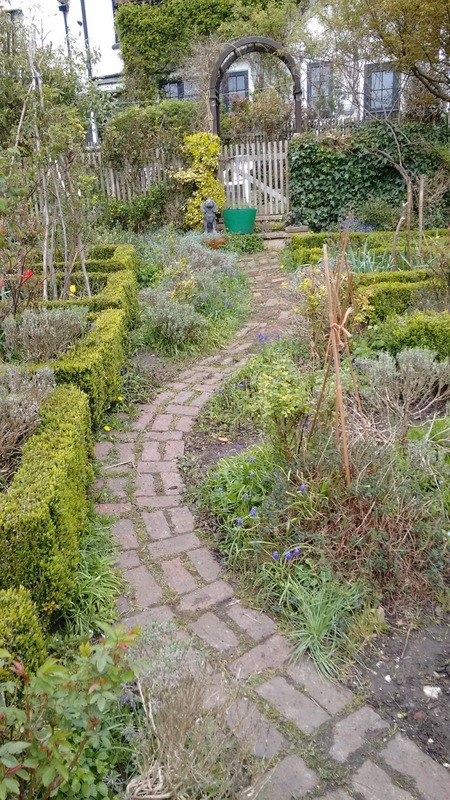 One of my first jobs would have been weeding either side of this path and the box boxes either side, unfortunately I have had more pressing jobs but will get to this soon I hope. Not bad for someone dealing with Lyme Disease or Lyme Arthritis, who could barely walk a few years ago. Labels: agapanthus, Amelanchier, box, Clematis, ground elder, Lyme Arthritis, lyme Disease, Roses.